I call it the “Buffalo Chicken Omlet.” Take Buffalo style deli meat, eggs, blue cheese. 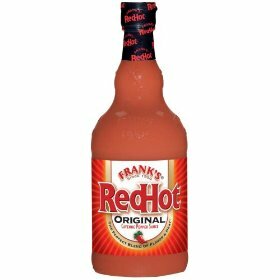 Standard omlet, insert the previously mentioned ingredients, and smother with Frank’s Red Hot. Well, this is where God decided to smite me today. Retribution for my glutenous ways. After finishing said delicious breakfast treat, I decided to go “get ready” in the bathroom. Unaware of the Franks Red Hot that was still on my fingers, I tried changing my contacts. Like a white hot iron in my eye, the burning still hasn’t stopped. Kill me now. I hope everyone has a wonderful April fools.